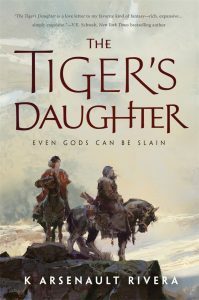 kt literary » Blog Archive » Starred PW review for THE TIGER’S DAUGHTER! Starred PW review for THE TIGER’S DAUGHTER! Huge round of congratulations to K Arsenault Rivera on this glowing starred review for THE TIGER’S DAUGHTER – her debut fantasy novel coming October 3, 2017 from TOR Books! Rivera’s wonderfully intricate Asian-inspired epic fantasy debut introduces two young women bound by fate: Shizuka, whose uncle is the Emperor Yoshimoto, and Barsalyya Shefali Alshar, whose mother is Kharsa Burqila, the ruler of the Qorin. Omens are present at the birth of both children, a month apart: a pair of pine needles visible between their eyes. Though they come from very different backgrounds— Shefali is a horsewoman of the Qorin steppes and Shizuka the pampered heir of the Hokkaran Empire—their mothers determine that the omen means the pair will be lifelong friends. This initial association propels the two young women into grand adventures that become the stuff of legend as they discover the extent of their superhuman powers. Rivera’s immense imagination and finely detailed worldbuilding have produced a series introduction of mammoth scope.